The set of stainless steel balls that gives whole satisfaction ! Earn 125 loyalty points with the purchase of this product. MS Inox balls are half-tender balls. 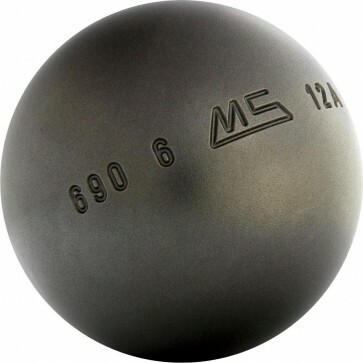 Petanque ball MS Inox give full staisfaction. They take advantage of satiny finishion. Stainless steel do no required a regular maintenance. Distinguish you on the ground by engraving your balls ! It will allows to recognize easily your balls, espacially in the event of an other player had the same balls. We propose 3 types of engraving : stylish (2 capital letters), long (until 15 characters) and initials (until 3 characters). Discover details of personlized engraving. Stainless steel does not require any special maintenance. 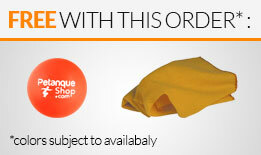 Clean your balls after each game with a microfiber wiping cloth to remove dust. Then wash with soap and water. You can, however, ;oil them occasionally to make them shine. It is normal that some appear stainless leave small rust. Reviews published on PetanqueShop.com are collected by Yotpo. They are displayed in chronological order, from the most recent to the oldest. The opinions are moderated, a priori, according to the criteria available on cette page. LA BOULE BLEUE "Super Carbon 125"